1. Alzheimer’s Disease: Research shows that compounds found in sweet cherries can play a role in protecting neuronal cells, which are involved in brain function and reduce oxidant stress and can potentially reduce the risk of Alzheimer’s (Kim, 2005). 2. Cancer: Fiber, vitamin C, carotenoids and anthocyanins are a quadruplet of cancer-preventative components found in sweet cherries. In addition, cyanidin, also found in cherries, significantly increases free radical scavenging of the body, which is known to help prevent and fight cancer (Acquaviva, 2003). 3. 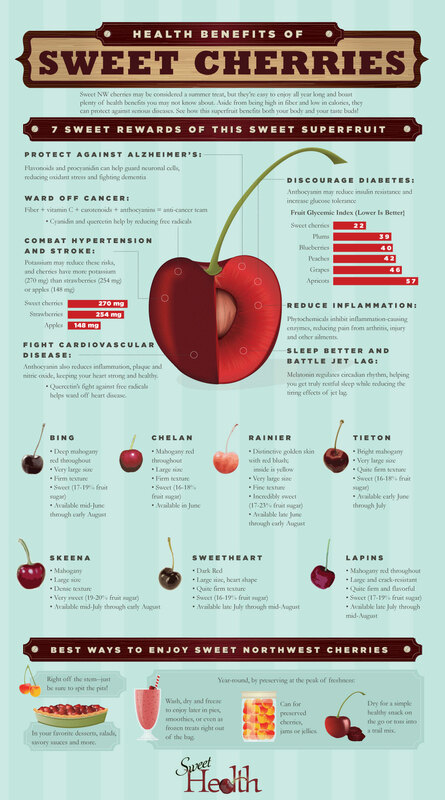 Cardiovascular Disease: The anthocyanins found in cherries can significantly reduce the risk of cardiovascular disease; it does this by protecting your body’s lipids from a host of damaging possibilities, including inflammation, cardiovascular plaque and nitric oxide formation (Reddy, 2005). 5. Inflammation: Cherries have also been shown to reduce inflammation through their powerful phytochemicals, which are known to inhibit the enzymes responsible for causing painful inflammation (Seernam, 2003). 6. Hypertension and stroke: A serving of cherries has a whopping 270 mg of potassium, compared to apples which have 148 mg and strawberries which have 254 mg. Evidence shows that adequate potassium reduces the risk hypertension and stroke (He, 2003).